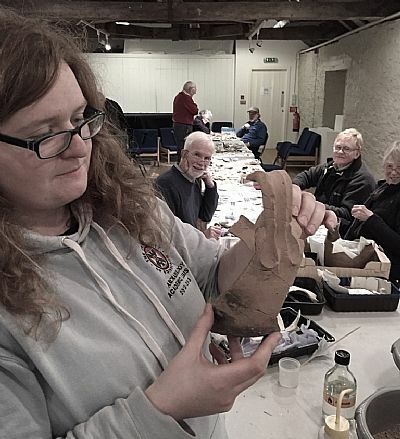 We had a superb team assembled in the Old Brewery, Cromarty during the November visit by the project's ceramics specialists Derek Hall and George Haggarty. 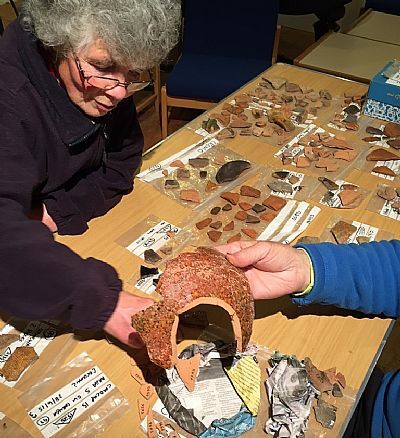 During their visit, they noted that the 2015 season medieval assemblage provided further evidence for local pot manufacture, including a somewhat distinctive method of handle attachment on or just below the rim and a possible kiln prop and waster sherd. While there were few sherds of high quality Scottish White Gritty Wares and imported material, two sherds of mid-16th century Beauvais Scraffitto hinted at high status occupation (associated in Scotland with religious sites). 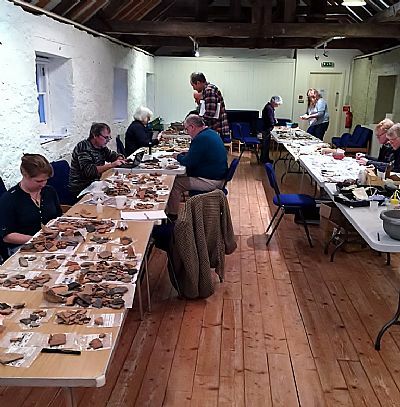 They also noted a signficant lack in early 12th/13th century ceramics, likely due to the fact that more excavation is needed! From the Industrial ceramic assemblage, most of the later 19th century cut sponge decorated shards appear to be products of the Glasgow potteries. Most of this material is of Victorian date, with the exception of a small group of mid 18th century Chinese Export Porcelain, White Salt Glazed Stoneware, Dipped and Banded creamware and decorated pearlwares dating from the later 18th and early 19th centuries. George and Derek's full 2015 assessment can be found under the Documents section of the website.